It’s hard to believe it’s time to prepare for the next holiday dinner and for many of us Thanksgiving is going to roll right into Christmas much too quickly. Changing up the table decoration within a short time can put a dent in the fun, as well as the pocket book, but no need to worry if you can find a scheme that easily flows from one holiday to the next with items you may already have and make it new for each meal with a bit of embroidery. 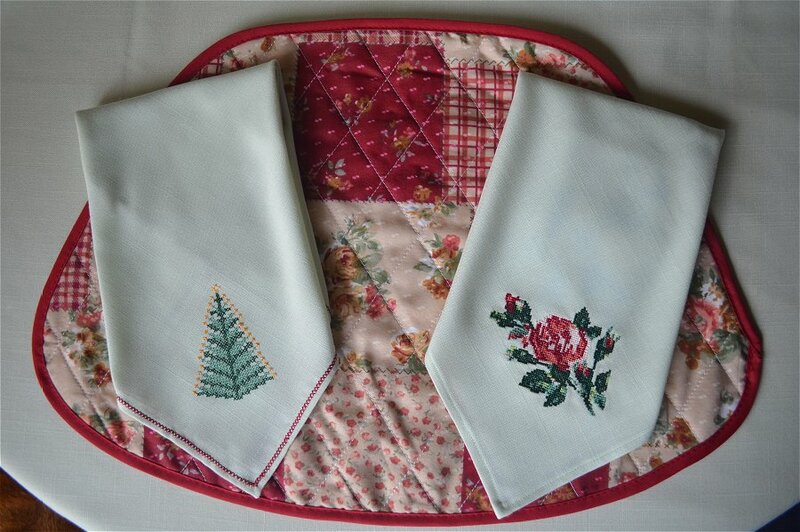 I decided to create two different sets of napkins to coordinate with one set of placemats and I used fabric from my stash and a couple of Free Designs I had downloaded from EmbroideryDesigns.com. A harvest gold tablecloth is perfect for Thanksgiving and a light green tablecloth will brighten the table for Christmas, both which I have already in my linen closet, so my total cost for this solution is $0 with the exception of the original investment. But even if I had to purchase fabric the project would be low cost for one yard to make four napkins. Another option, of course, is to hit the dollar store for all items, including the napkins, and simply add a little embroidery to beautify, but considering I had the perfect fabric stashed, I decided it was time to put it to use and save a few dollars. I had originally purchased the “linen-like” fabric for napkins and a table cloth I’d made 15 years ago, so I knew that it would work well for this project. Having found it in the remnant shelf so long ago, I can’t say exactly what type of fabric it is, though I know it’s not 100% flax or cotton and must be some sort of blend, because it launders well and dries with very little wrinkling. Back then the perfect backing to use for embroidery on this type of fabric was a heat and bond adhesive, but this time I decided to test out a sheet of Stick and Wash, a new product being made available soon at MyEnMart.com and I’m so very pleased I did! The results are remarkable as you can see when comparing both napkins after they were lightly pressed. The napkin on the right is one of the first napkins I’d made with the heat bond adhesive stabilizer along with a sheet of tear-away and even though it reveals a bit of puckering, I thought it turned out pretty darn nice back then. (We have come such a long way when it comes to stabilizers!) The napkin on the left is backed with Stick and Wash with the addition of a sheet of non-fibrous water soluble stabilizer (for hooping purposes only; you could also use a fibrous water soluble stabilizer like Badgemaster Aquafilm) and embroidered with a design that contains twice the amount of stitches, but there is absolutely no distortion to either the fabric or design – results that I can only credit to the adhesive water soluble backing. Whether you use this particular brand of backing or one of your own favorites when stitching on napkins, I highly recommend an adhesive water soluble backing for an easy hooping process and the best stabilization that disappears in the wash. 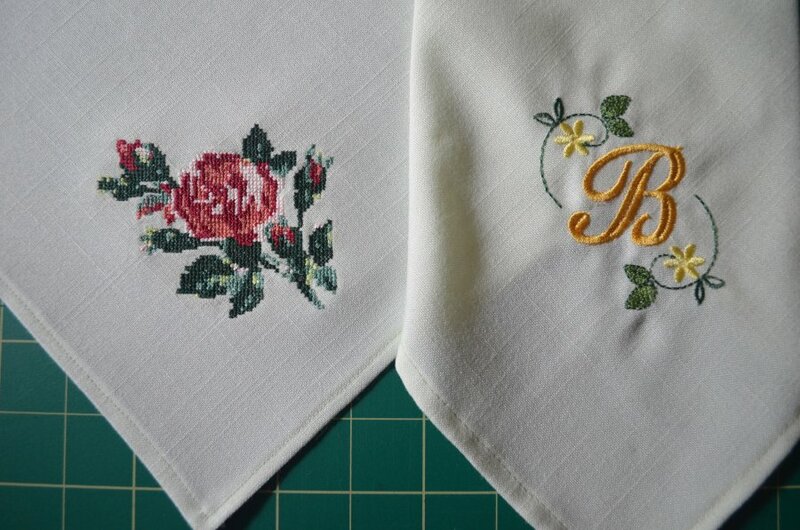 This is a great project for all skill levels that takes only a few hours for each napkin, depending on the embroidery design you choose. 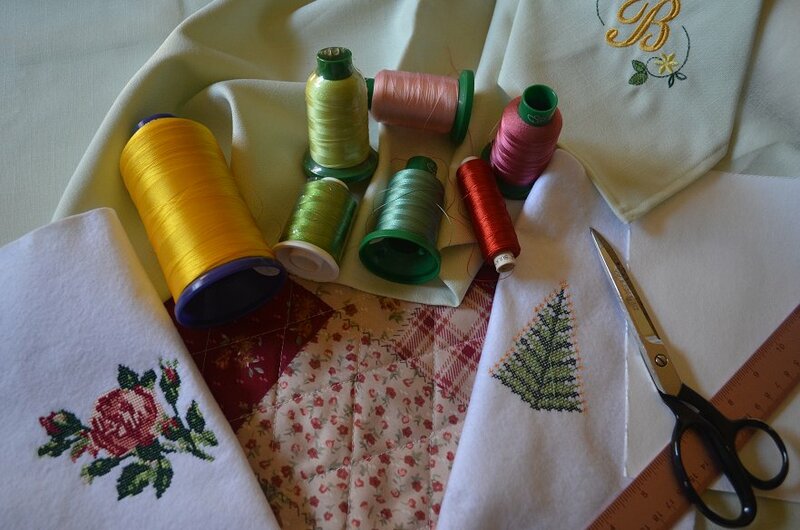 Gather materials and choose shades of thread colors that match those found in the placemat. The two designs I’m embroidering need three shades of green, three shades of red and one gold (colors that I used in the final sewing are not the same as seen in this image). As always, run a sample of the design you’ll be using. Normally I would stitch my samples on the same or similar fabric but I’ve already tested embroidery on this fabric (napkin at upper right) and know what backing it will require so I’ve opted to test color matching as well as the actual sewing of the designs on felt. Cut the fabric to the preferred size and add 1/2” to be used for the hem. A standard size for a napkin ranges between 14-18” square. I cut mine to 18 1/2”. Use a sharp scissors or a rotary cutter together with a ruler to get the cleanest cut. Pin and iron hem. 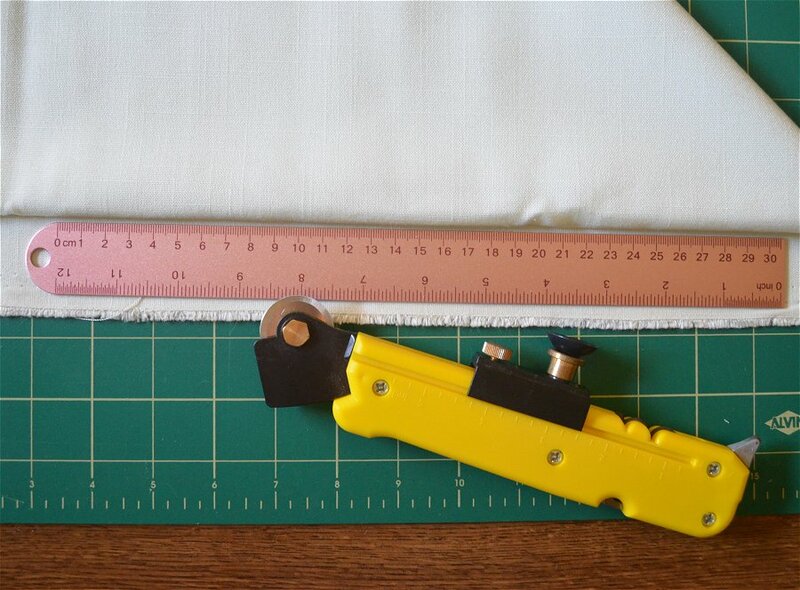 Press the fold first at 1/2” using a hem gauge or ruler for accuracy and pin in a few places to hold until done with each side. 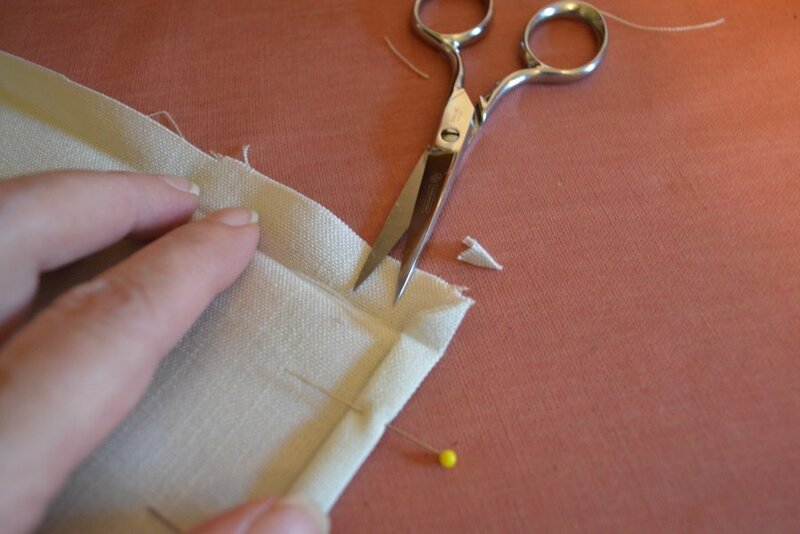 Then fold in the edge to meet the inside of the fold and pin to stitch a ¼” hem. Remove excess bulk from corners by trimming at an angle. If you prefer to take a little more time, you can neatly miter the corners by first pressing the corner inward and then fold and press the sides as shown in the images. 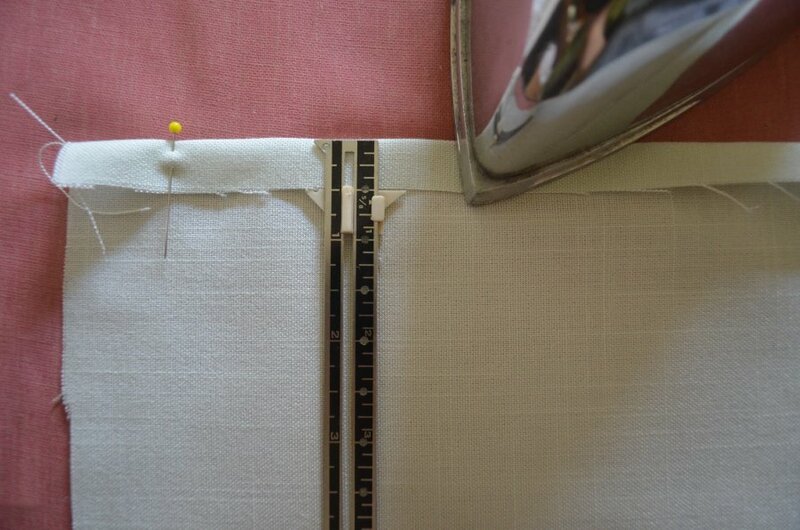 Trim away excess fabric at the corner of the fabric that will not be hidden by the finished hem. You could also fold under the corner of the fabric, but this would add to unnecessary bulk and cause issues while stitching the hem at the corner. Stitch a narrow hem. Sew slowly and continue to check the back side to be sure the edge of the hem is being caught by the stitches. 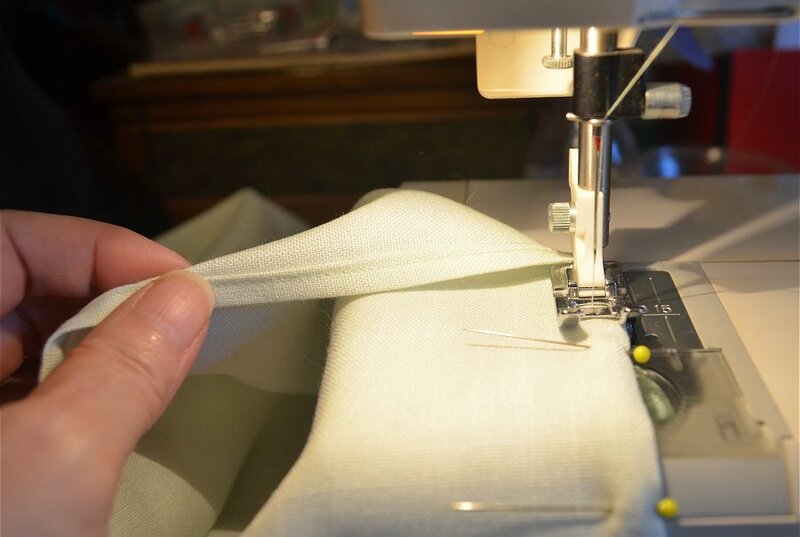 When you reach a corner, you can either keep the needle down and pivot the fabric and then continue stitching the next side, or you can stitch to the edge, backstitch to lock, remove from the machine and clip, and then begin the next side at the edge, being sure to backstitch again, and continue forward, crossing over the previously stitched seam. Do not hoop the napkin. 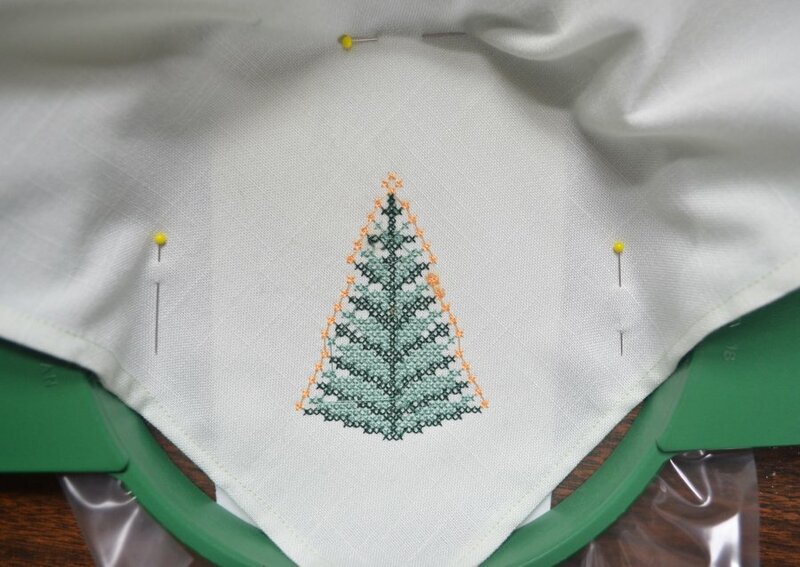 Lay the corner of the napkin over the hoop (with the bulk towards you on a multi-needle machine) and rotate the design to stitch appropriately. Press the fabric against the adhesive backing to secure and if preferred, pin at a few places close to the hoop. Cut away excess up to the stitches at the outside of the design At this point, you could toss in the washing machine to remove the excess, but fast removal can be done by first soaking in lukewarm water for about 15 minutes and most of the backing will rinse away or brushed away with a soft bristle brush. If preferred, embellish with your choice of trim around the napkin edge or add decorative stitching. I decided that the napkin with the tree design needed a little red to coordinate with the colors in the placemat. The red of the trim I had on hand didn’t match well enough so I opted to stitch a cross stitch edging over the existing stitches of the hem. You can have a lot of fun making napkins. Embellish a set for the most elegant moments and others that will bring the sweet giggles of children. 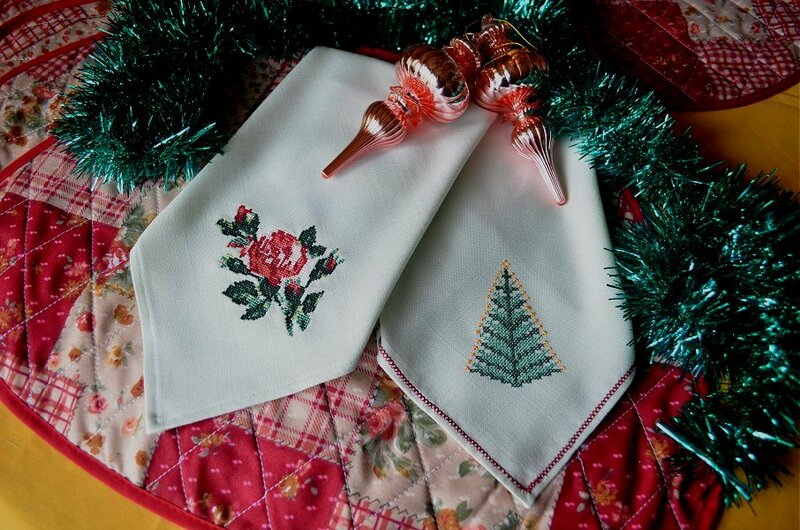 Either way embroidery will brighten your holiday table and set the mood for much merriment and cheer. ~ Till next time, keep on stitchin’!